Only 6 ingredients to make this delicious and refreshing ice cream pie — the perfect summer treat! Our little 4 year old will be turning 5 soon and he’s been very excited about his upcoming birthday. While he’s been talking nonstop about blowing out candles (his favorite), I’m just trying to come to terms with the fact that my little guy is going to be 5! Over the years he’s become quite the little foodie and when I asked him what he wanted for his birthday dessert, he didn’t hesitate to tell me — this chocolate cheesecake and lots of ice cream! I don’t think I’ve ever known anyone to love ice cream as much as Grey. The next question I asked him was, “who do you want to come to your party?” to which he looked at me and hesitated. When he told me he didn’t want anyone, I pressed a little and finally got it out of him that if people came to his party, they would eat all of the ice cream. ?I’m telling you, this guy takes his ice cream very seriously! However, the minute I promised to have several containers of ice cream, he was ready to invite everyone to his party! 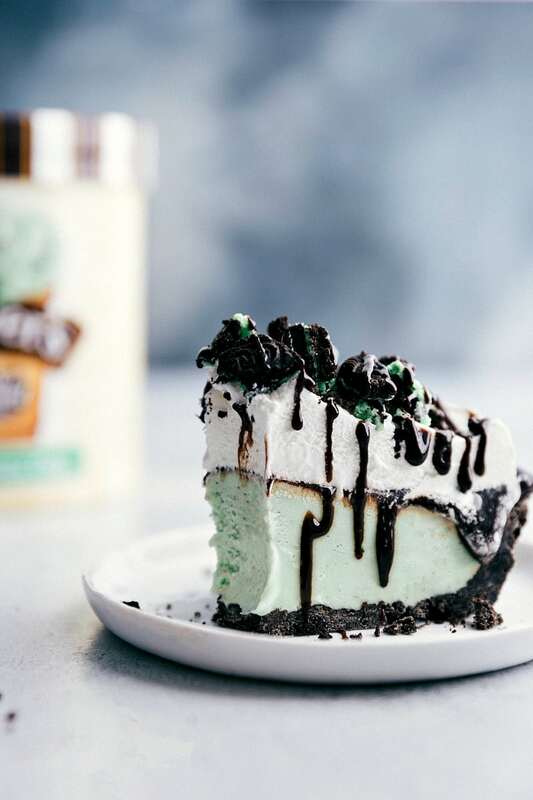 So in honor of my almost 5-year-old ice cream fanatic and the extreme summer heat I’m sharing this amazing grasshopper ice cream pie! It’s so simple to assemble, no baking is required, and results in the best combination of chocolate + mint. 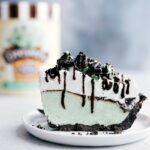 I’m using Dreyer’s Mint Chocolate Chip ice cream as the main component of this pie. It’s rich, delicious, and looks beautiful in this pie. 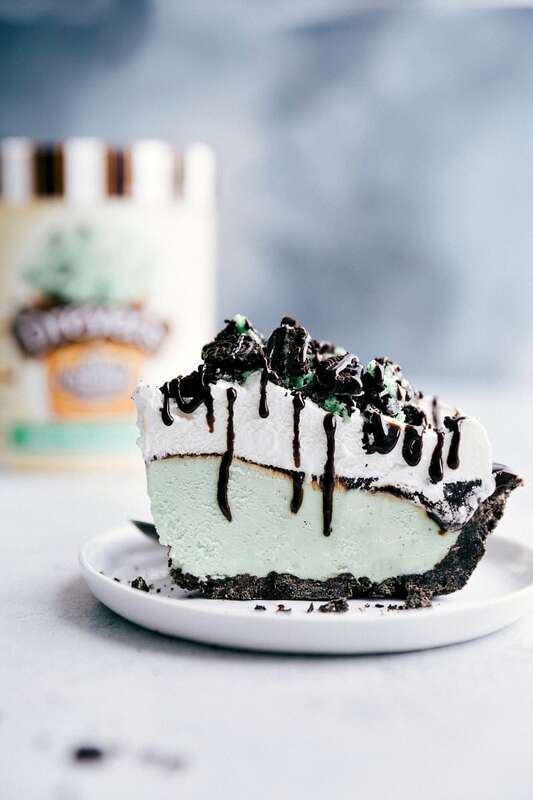 This grasshopper ice cream pie is the best dessert to bring to a potluck or party with friends, family, extended family, work friends, etc. While it hardly takes anytime to assemble, it looks impressive. And best of all, this dessert really lets the ice cream shine through! 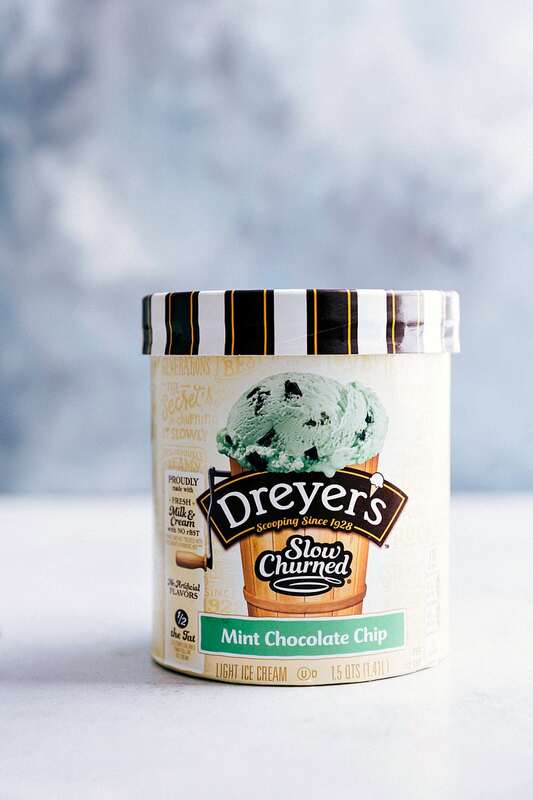 Dreyer’s ice cream flavors bring people together. Which is especially true for my family, as long as we make sure there is enough for Grey. ? Only 6 ingredients to make this delicious and refreshing ice cream pie -- the perfect summer treat! Lightly grease a 9-inch pie pan with cooking spray and set aside. In a food processor or blender, pulse 20 of the mint sandwich cookies (no need to separate cookie from filing) until you’ve got cookie crumbs. You should get around 1 cup cookie crumbs. In a small bowl, combine the mint cookie crumbs, sugar, and butter. Press firmly into the bottom of the prepared pan. Place in the freezer for 10 minutes. Remove the ice cream to slightly soften for the last 5 minutes. 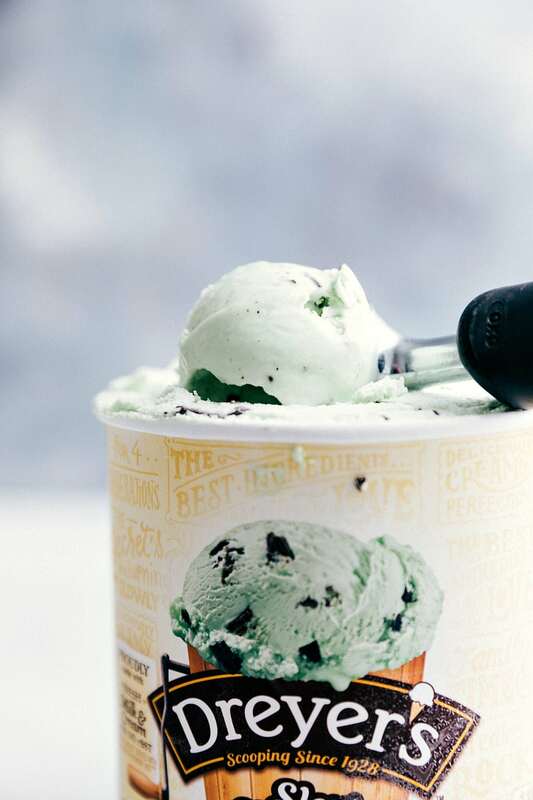 Smooth the ice cream evenly over the cookie crust and smooth the top evenly with the back of a large spoon or spatula. Freeze for 20-30 minutes or until solid. Remove from the freezer and smooth all but 3-4 tablespoons of the chocolate fudge sauce evenly over the ice cream. Loosely cover and return to freezer for at least one hour or until ready to serve. Right before serving, smooth the whipped cream over the chocolate fudge layer (I only like to add the whipped cream to the slices that will get eaten same day otherwise the whipped cream tends to get icy if refrozen). Coarsely chop the remaining 5 mint cookies and sprinkle over individual pieces. Drizzle the reserved 3-4 tablespoons hot fudge sauce over individual pieces. loved this grasshopper ice cream pie, so easy to make yet so delicious!